Please note you will need good physical and manual dexterity to attend this course. 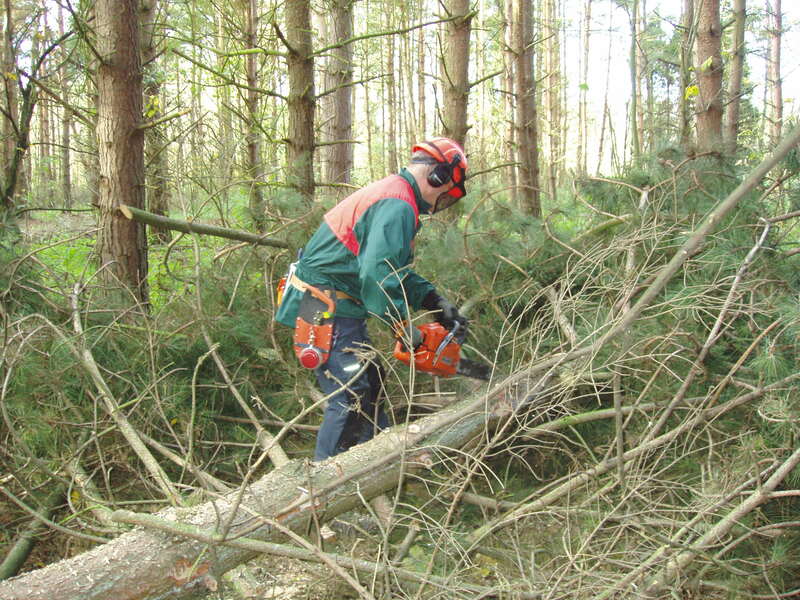 Chainsaws and personal protective equipment (PPE) is mandatory for this training and must be supplied by the trainee. Hire of some items may be possible. Enquire for details. Click on the date to book. Please note there will be an extra day required for your assessment, the cost of LANTRA and NPTC registration is included in the fee for this course. As an untrained (but semi-experienced) user of chainsaws this course came as a bit of a shock. I had never realized the extent of current legislation, nor had I actually read PUWER 98 – clearly I had a lot of learning to do! Mark Pardoe was excellent, the course facilities were basic but more than adequate. The access to forested area good. First 2 days a little slow while we worked through the basics, but close tutoring and plenty of practical experience leading to a successful assessment (not everyone passed). The documentation and support from Fran at East Malling was really useful. This course changed my outlook and consideration of safety factors dramatically.